The PhD Plus 10 Study was our first-ever follow-up of mid-career physics PhD recipients. In 2011, we contacted individuals who graduated with a physics PhD from the classes of 1996, 1997, 2000, and 2001 in the United States. Of those who responded to our survey, 597 were employed in academia. In this report, we focus on three groups: (1) respondents employed in physics or astronomy departments at four-year institutions, (2) respondents employed in departments other than physics or astronomy at four-year institutions, and (3) respondents employed at two-year colleges. In this report, we will describe the activities that academic employees perform during their work and what they find rewarding about their positions. 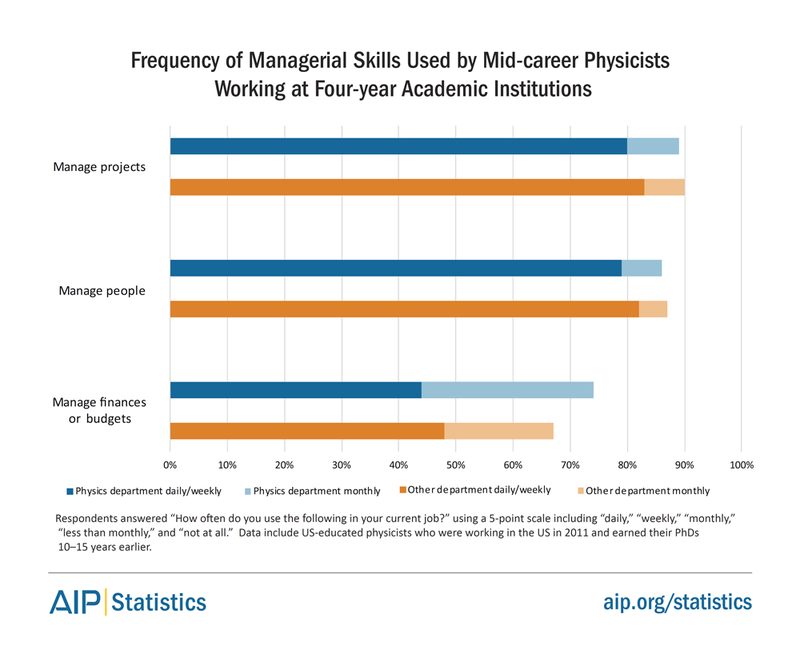 Of survey respondents, 464 academic employees worked in physics or astronomy departments at four-year institutions, 106 worked in other academic departments at four-year institutions, and 27 worked at two-year colleges. Academic rank and status. Tables 1 and 2 compare academic respondents at four-year institutions by academic rank and tenure status. At four-year institutions, most respondents were tenured associate professors. The number of respondents at two-year colleges was too small to calculate percentages. Out of the 27 respondents at two-year colleges, 22 had tenure or tenure-track positions. 7 were full professors, 6 were associate professors, 5 were assistant professors, and 6 were adjuncts or instructors. Department types. At four-year institutions, respondents in other departments reported working in engineering, mathematics, chemistry, information technology, advanced computing, biology, natural sciences, medicine, marine sciences, and biochemistry departments. At two-year colleges, the academic structure is more fluid, and respondents reported working in a variety of academic units including physics, astronomy, physical sciences, natural sciences, mathematics, and general education. When describing their current responsibilities, respondents at four-year institutions reported what courses they taught and what types of research they performed (Table 3). Respondents across physics, astronomy, and other departments taught similar academic courses; however, they performed research on different topics. 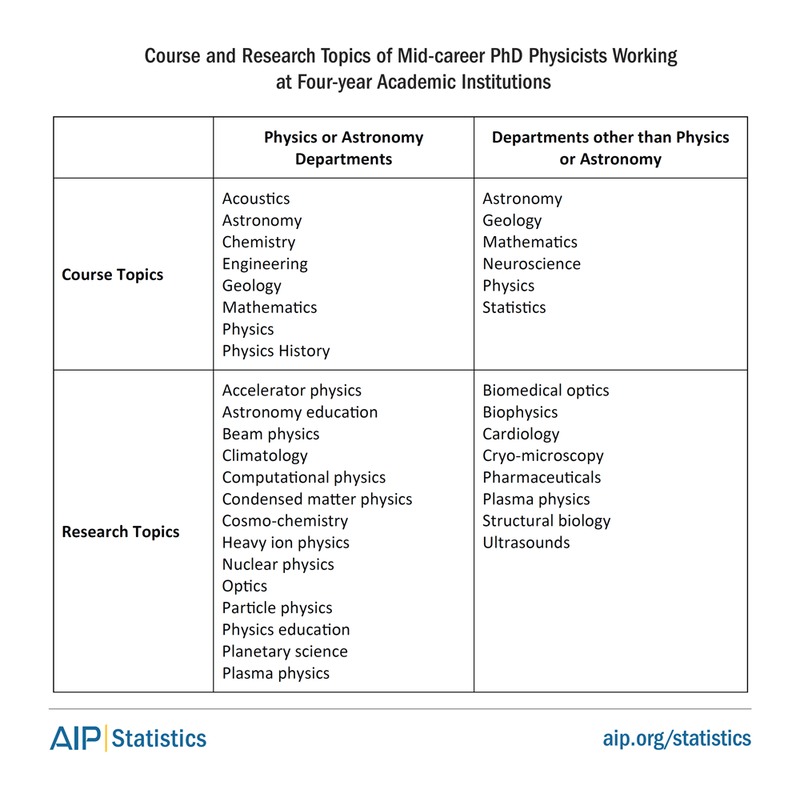 Not surprisingly, respondents in physics and astronomy departments focused on research within subfields in physics, astronomy, and optics. In other departments, some respondents performed research in physics and optics, but others researched topics in biology and medicine. There were also unique responsibilities when comparing departments (Table 4). 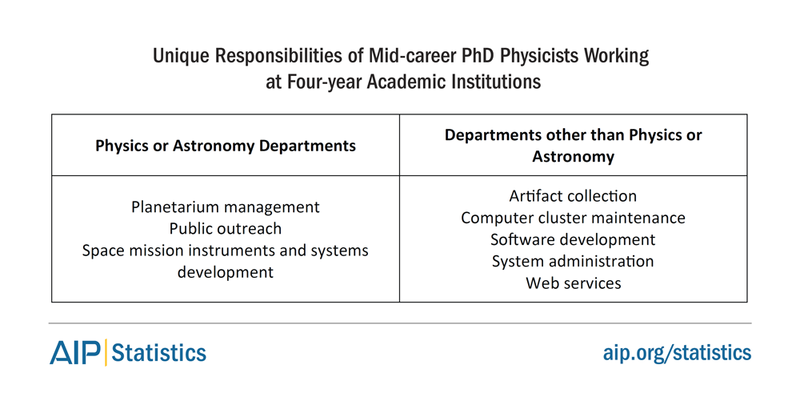 In physics or astronomy departments, respondents’ unique responsibilities involved public outreach, planetariums, and space mission support. In other departments, respondents’ unique responsibilities involved artifacts, software, and IT activities. Two-year colleges. Teaching was the most frequent responsibility reported by respondents at two-year colleges, and their primary responsibilities included teaching courses in physics, astronomy, and mathematics. Many respondents also performed administrative tasks for the college, mentored students, performed public outreach, served as department chairs, and served on committees. The respondents from two-year colleges who performed research indicated that they did it over the summer months at different institutions. Four-year institutions. In our survey, we asked academic respondents “how often do you use or do the following things in your current job?” Respondents rated how often they used 24 different skills (daily, weekly, monthly, less than monthly, or not at all). Figures 1–5 compare the skill usage at four-year institutions across five categories: research skills, interpersonal skills, technical skills, managerial skills, and communication skills. Across all departments, respondents most often performed complex problem solving, taught courses, and managed projects. 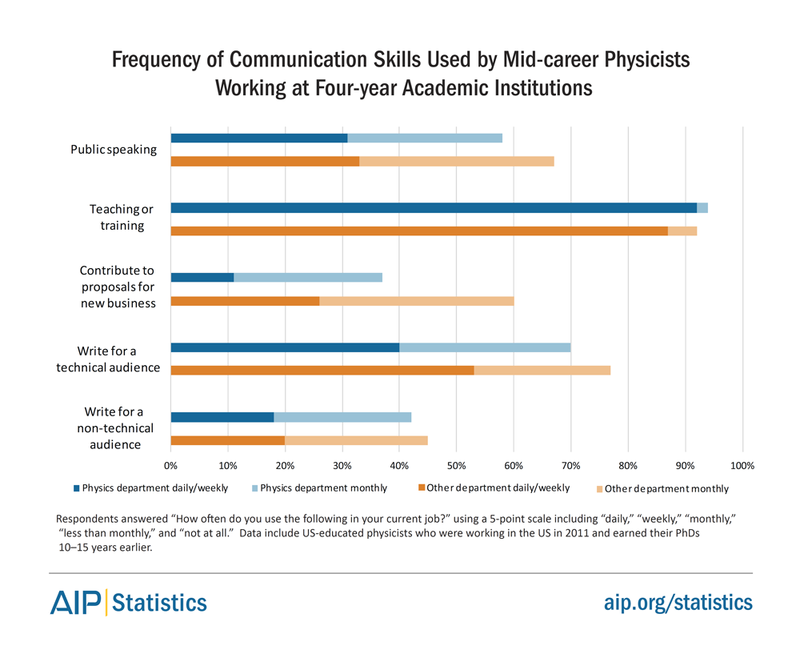 Not surprisingly, respondents in physics and astronomy departments used physics principles, conducted basic research, and collaborated with physicists more often than respondents in other departments. Respondents in other departments were more often involved in applied research, design or development, proposal writing, and more often collaborated with individuals from diverse professions. Two-year colleges. Due to a smaller sample size, we were unable to directly compare responses from faculty members at two-year colleges with those from faculty members at four-year institutions. 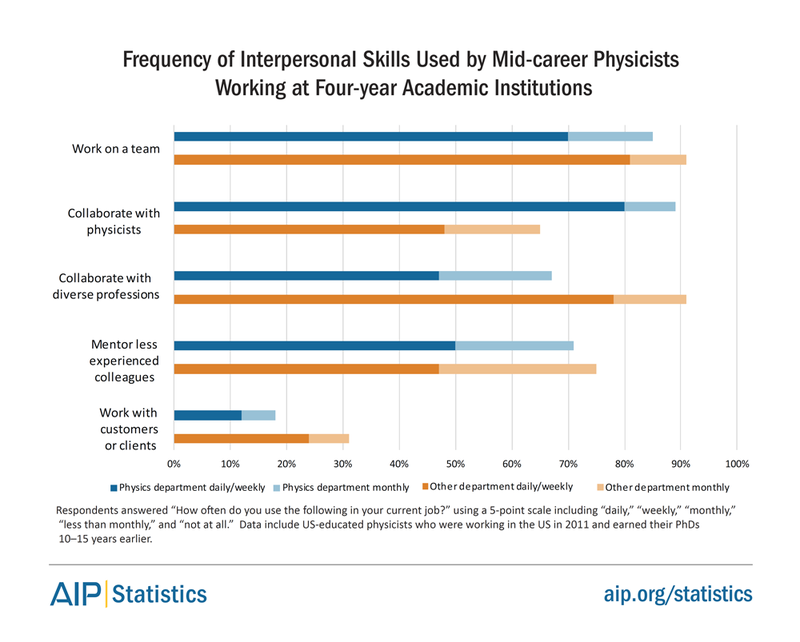 Respondents from two-year colleges most often reported using the following skills: teaching, using basic physics principles, and collaborating with individuals from diverse professions. Contributing to proposals, performing applied research, and providing technical support were skills used least frequently. Most frequent rewards. We asked respondents: “what are the most rewarding aspects of your current job?” Table 5 lists the most frequently reported job rewards at four-year institutions and two-year colleges. 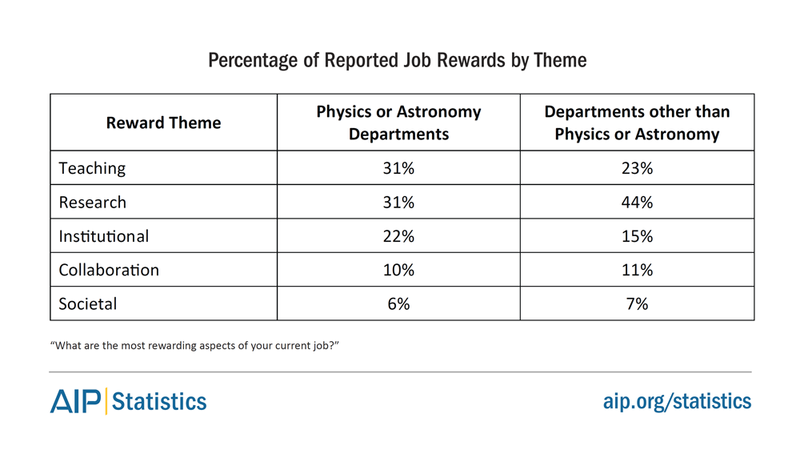 Physics, astronomy, and other department respondents reported identical rewards, although in slightly different orders of frequency. Across all departments, respondents at four-year institution most frequently reported rewards about autonomy, mentoring, learning, problem-solving, and collaborating. At two-year colleges, respondents most frequently reported rewards about teaching, interactions with students, collaborations, and autonomy. Unique rewards. Table 6 lists the unique job rewards reported by respondents in physics or astronomy departments, other departments, and two-year colleges. 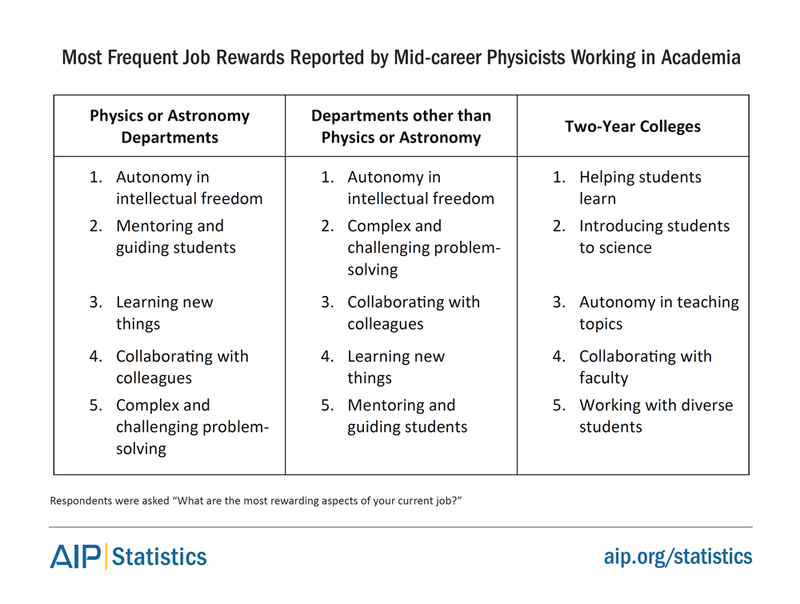 Respondents in physics or astronomy departments felt rewarded when they performed public outreach, developed instrumentation, helped students struggling with physics, and published in physics journals. Respondents from other departments felt rewarded when they developed software and when their work was applied in society. Respondents from two-year colleges described unique teaching rewards such as working with diverse students and working at an institution that prioritizes teaching. Reward themes. When examining all job rewards reported by respondents employed in academic positions, we found five major themes: teaching rewards, research rewards, institutional rewards, collaboration rewards, and societal rewards. Table 7 shows the percentage of how often different themes were reported in the survey responses. 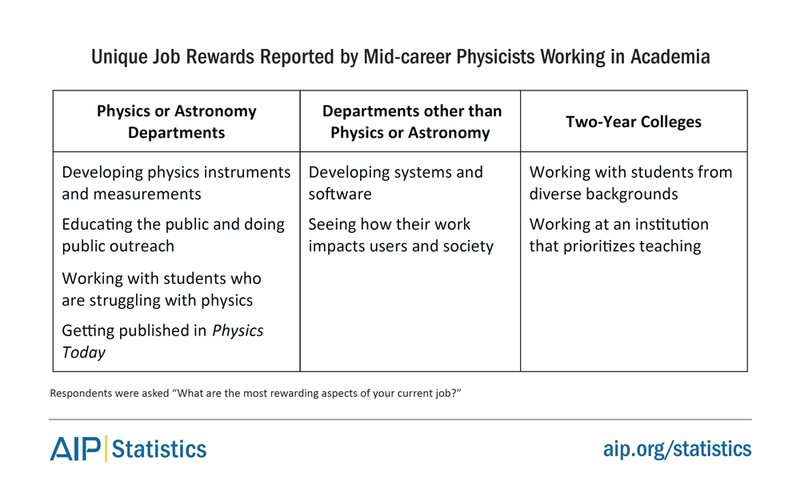 At physics or astronomy departments, respondents most frequently reported teaching and research related rewards. At other departments, respondents most frequently reported research related rewards. Due to a smaller sample size, we were unable to directly compare responses from faculty members at two-year colleges with those at four-year institutions. Of two-year college respondents, teaching rewards were reported the most often, and were 62% of the total number of reported job rewards. In the following section, we describe all five reward themes reported by respondents, and provide samples of quotes that represent each theme. Teaching rewards. This theme includes any reported rewards related to teaching activities and interactions with students. Respondents in academia enjoyed working with students, especially those who were motivated, passionate, and from diverse backgrounds. They felt rewarded when they positively influenced their students’ way of thinking and helped them better understand both the teaching material and the natural world around them. For some, they felt rewarded when they supported students who initially struggled in class, or students who were initially uninterested or anxious about the course material. Additionally, many enjoyed mentoring students who might become future scientists or science teachers. They frequently reported helping their students design research projects, find employment, or further their education. Other respondents focused on developing their own teaching skills, and enjoyed designing and innovating new education techniques. Research rewards. This theme describes any reported rewards related to mental and procedural tasks during the research process. Many academic respondents enjoyed their work when it was intellectually challenging, involved solving new and cutting-edge scientific problems, and involved discovering new things about the world. In research projects, they enjoyed designing experiments, creating new software or instrumentation, finding results, and publishing their findings. Most research rewards were reported by respondents at four-year institutions, but there were some two-year college respondents who also enjoyed performing research over the summer and publishing results. Institutional rewards. This theme includes any rewards that were related to an institution’s benefits, resources, or supports for their current positions. Most importantly, academic respondents valued autonomy and flexibility in their current positions, and enjoyed managing their own research interests, teaching interests, and work schedule. Others valued job benefits provided in their positions such as job security, salary, sabbaticals, and free time over the summer. Respondents had different opinions about what they valued in their department and university work environment. Some preferred it when their institution prioritized teaching. Others preferred it when their institution prioritized research, especially when there was less pressure to publish research findings. Collaboration rewards. This theme describes any rewards related to social interactions with non-students. Many respondents enjoyed their work when they collaborated with colleagues during research and teaching, particularly with collaborators from other disciplines and other countries. Societal rewards. This theme includes any rewards related to society or the larger scientific community. Respondents working in physics or astronomy departments enjoyed creating scientific instruments, measures, and hardware that helped other scientists in their fields. Furthermore, respondents felt rewarded when their work was recognized by the scientific community, such as being published in Physics Today. Lastly, they felt rewarded when they helped the general public better understand science and improved science education. Respondents employed in departments other than physics or astronomy felt rewarded when they designed software and systems that helped others in their fields. Respondents from two-year colleges did not specifically mention any rewards related to society or the larger scientific community. However, the number of respondents from two-year colleges was small, and these rewards might have been reported with a larger sample size. 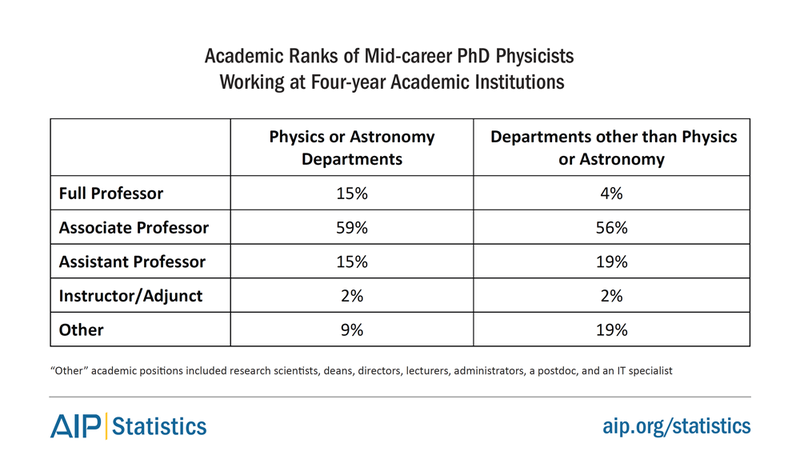 In this report, we compared mid-career physics PhD recipients employed in physics or astronomy departments at four-year institutions, departments other than physics or astronomy at four-year institutions, and those employed at two-year colleges. As expected of mid-career graduates, most individuals were associate professors with tenure status. Across four-year institutions, employees reported similar job responsibilities. Four-year institution employees most often reported teaching college courses, performing research, mentoring students and younger teachers, and performing activities that serve their department. Those working at four-year institutions taught a wide variety of courses and performed research in a wide variety of scientific fields. Employees working at two-year colleges most often reported performing teaching responsibilities. When academic employees reported on what they found rewarding about their work, they reported rewards related to teaching, research, institutional benefits, social collaborations, and positively impacting society and the scientific community. The most frequently reported rewards at four-year institutions and two-year colleges included: having the autonomy to pursue intellectual and teaching interests, mentoring and working with students, learning new things during research, collaborating with colleagues, and solving challenging and complex problems. During 2011, we contacted over 3,400 physics PhD recipients from the classes of 1996, 1997, 2000, and 2001, and who graduated from US institutions. We received responses from 1,544 individuals that were currently working in the US. We know that the respondents are not representative. It was easier to find members of the more recent classes than the earlier classes, and based on an analysis of the respondents by contact wave, we believe that it was harder to contact individuals employed in industry than those in academia or the government. So, academics are over-represented among our respondents. 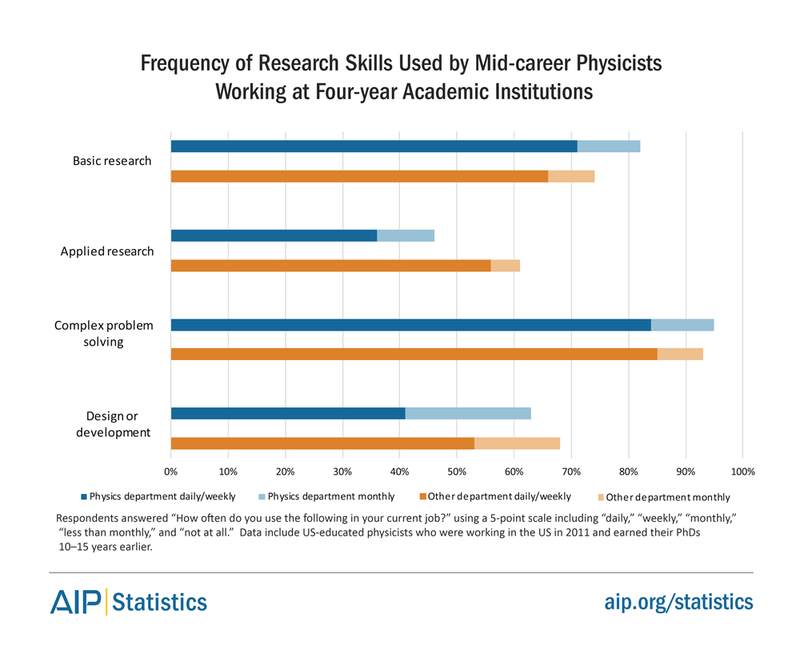 For a complete overview of the methodology, please see the Appendix in Common Careers of Physicists in the Private Sector by Roman Czujko and Garrett Anderson. 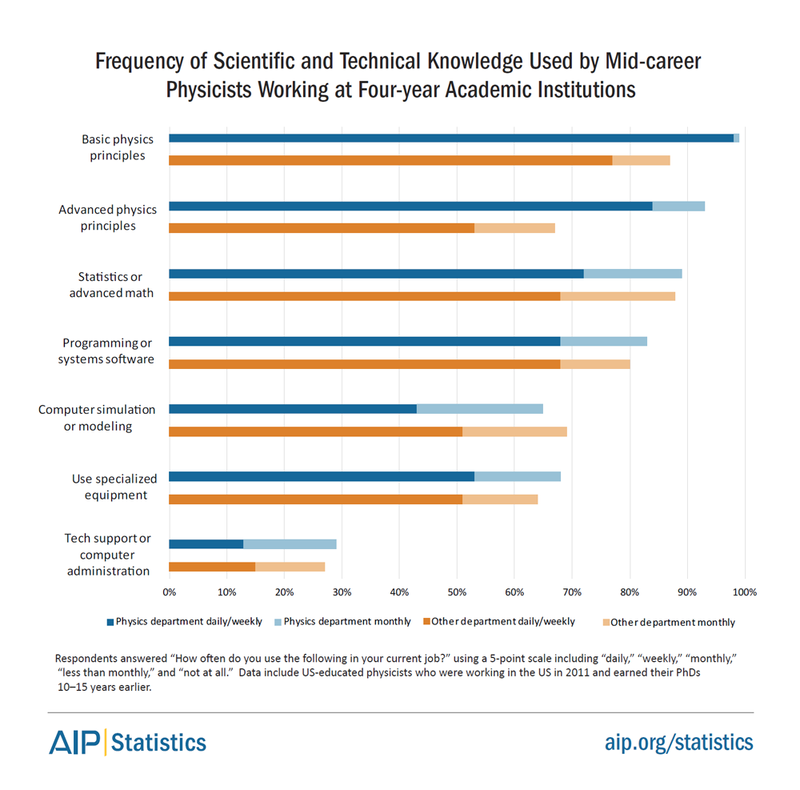 This report is available online here (or at https://www.aip.org/statistics/reports/common-careers-physicists-private-sector). You can sign up to receive e-mail alerts which notify you when we post a new report. Visit www.aip.org/statistics/e_updates to sign up. You can indicate your area(s) of interest; we will send you an e-Update only when we post a new report that includes data of interest to you. If you sign up for every possible notification, you should receive no more than 20 messages in a year. The Statistical Research Center is your source for data on education and employment in physics, astronomy, and other physical sciences. Follow us at @AIPStatistics.